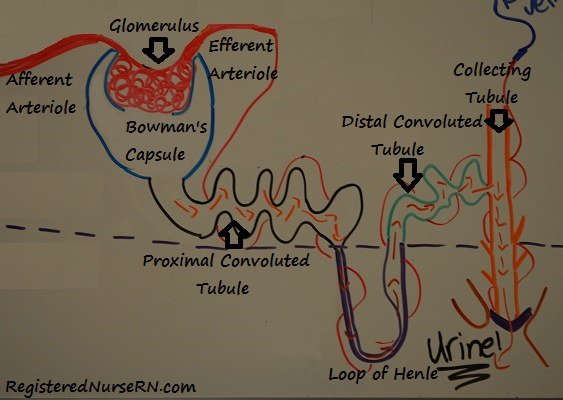 This NCLEX review will discuss nephron structure and function. As a nursing student, you must be familiar with the basic structure of the kidney and its nephron. It will help you understand the diseases that affect the renal system. Don’t forget to take the nephron structure and function quiz. What is the role of the nephron? The nephron is the functional part of the kidneys that filters the blood (renal corpuscle), reabsorbs minerals/water and secretes waste (renal tubule), and produces the substance called urine which will drain down into the ureters, be stored in the bladder, and voided out via the urethra. Each kidney/nephron receives fresh blood from the heart via the renal artery, and drains filtered blood back to the heart via the renal vein (discussed more below). Each kidney contains MILLIONS of nephrons which are found in the renal cortex and renal medulla of the kidney. Parts of the nephron sit in the renal cortex, specifically the glomerulus and bowman’s capsule, proximal convoluted tubule. It then dips down in the renal medulla, specifically the loop of henle. Then the distal convoluted tubule goes back up into the renal cortex along with parts of the collecting tubule which then goes back down into the renal medulla and connects directly to the renal papilla and urine excretion begins. How does the nephron receive its blood supply? From the AFFERENT ARTERIOLE (which came from the renal artery)…the afferent arteriole sends blood to the first part of the nephron called the Glomerulus. Glomerulus: It is a collection of circular capillaries that have extremely high pressure which help perform ULTRAFILTRATION. During this process the blood will be filtered and FILTRATE will be created (which is a liquid consisting of the collection of fluid and particles that came from the blood). These substances will “drip” down into a capsule that surrounds the glomerulus called BOWMAN’S CAPSULE (collects the filtrate). What is filtered by the Glomerulus? Note: creatinine is solely filtered from the bloodstream via the glomerulus and is NOT reabsorbed or secreted within the nephron. Therefore, the rate of filtration of creatinine by the glomerulus helps us to determine the efficiency of the kidneys, which is why we collect blood levels to measure creatinine levels. Then the newly filtered blood exits via the EFFERENT arterioles which will go on and form the peritubular capillaries that will surround the nephrons. The peritubular capillaries on the loop of henle are known as the vasa recta. The peritubular capillaries will play a role in carrying the reabsorbed nutrients from the filtrate back into the body’s system to the renal vein and secreting substances (urea, ions) and drugs found in the blood into the tubules at certain points. Side Note….why do we called it RE-absorption rather the just absorption? The substances filtered from the glomerulus where already ABSORBED at some point in the GI tract via specialized cells which took the nutrients into the blood stream (most of this happens in the small intestine). Then the substances traveled through the body via the heart and made their way to the kidneys via the renal artery to be FILTERED out. Therefore, our body will RE-ABSORB these nutrients based on what our body needs (because we already absorbed them once from the food we ate). Then the left overs will be excreted in the urine. The created filtrate then flows through the proximal convoluted tubule (PCT) and this tubule reabsorbs MOST of the parts of the filtrate that we need to survive, which just came from the Bowman’s capsule. What does the Proximal Convoluted Tubule Reabsorb? What is secreted into the Proximal Convoluted Tubule from the peritubular capillaries? NOTE: Nearly 100% of glucose and amino acids will be reabsorbed. WHY? The body needs a constant supply of these substances to survive. In addition, 90% of bicarbonate will be reabsorbed to keep the blood’s pH normal rather than acidotic. 60-70% water and sodium/chloride will be reabsorbed and 50% of urea. Then the filtrate enters into the Loop of Henle (remember it is found down in the renal medulla). The loop of henle has a descending limb and ascending limb. Its goal is to concentrate the urine and it will accomplish this with the renal medulla. The renal medulla’s interstitial fluid is very hypertonic. This helps reabsorb water from the filtrate to maintain the body’s water and salt balance. The descending limb is ONLY PERMABLE TO WATER…while the ascending limb is ONLY PERMABLE TO IONS. Descending limb: When the filtrate enters the DCT it enters into a VERY salty environment. Now, remember water is in the filtrate! So, what is going to happen to the water once it hits this hypertonic environment? OSMOSIS….the water is going to be drawn to the salty environment and leave the tubule and be reabsorbed by the bloodstream. Hence, why the urine is going to become concentrated. Now, what is left in the filtrate is a lot of sodium, chloride, potassium etc. So, the filtrate will travel up through the ascending limb (remember it is ONLY PERMABLE to ions NOT water), and once the filtrate goes through the thick part of the ascending limb sodium and chloride (specifically), along with small amounts of potassium, is going to be actively pumped out of the filtrate into the renal medulla’s interstitial fluid which helps maintain this hypertonic environment. The filtrate then enters in the distal convoluted tubule where more substances are reabsorbed and secreted. What is reabsorbed and secreted in the distal convoluted tubule? Then the filtrate travels to the collecting tubule where the filtrate is brushed up with the final touches of reabsorption. What is reabsorbed in the collecting tubule? Water (under the influence of the anti-diuretic hormone ADH)…what does ADH do? It controls the amount of water that is stored in our body. Then the filtrate leaves the collecting tubule as urine which again flows through the renal papilla, minor/major calyx, renal pelvis, ureters, bladder, and urethra. What substances are in the urine? NOTE: glucose should not be found in the urine because it is nearly 100% reabsorbed in the proximal convoluted tubule…hence why if a physician suspects diabetes they will check the urine for glucose. Remember, in diabetes mellitus the body is unable to use glucose because the patient lacks insulin (which takes the glucose inside the cells). Therefore, the glucose will leak into the urine. Marieb, Elaine Nicpon, and Jon Mallatt. Human Anatomy. 3rd ed. San Francisco: Benjamin Cummings, 2001. Print. “Your Kidneys And How They Work | NIDDK”. National Institute of Diabetes and Digestive and Kidney Diseases. N.p., 2014. Web. 25 Apr. 2017.